They're back! 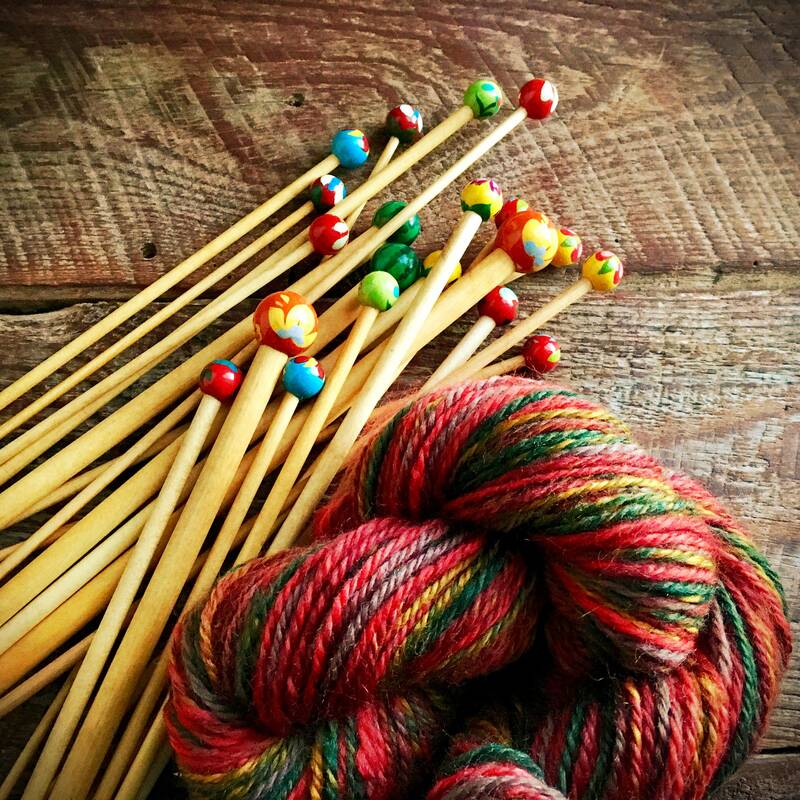 And to celebrate, the next order will receive a hank of the handspun yarn in the photos! That's a $30 value! 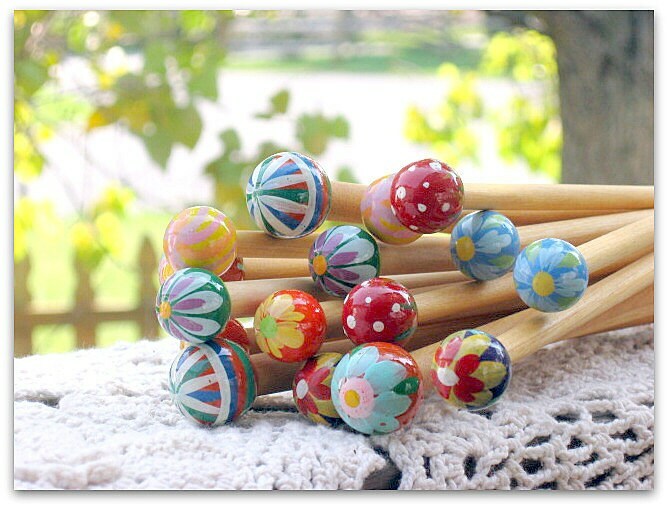 This is a whole set of 9 hand painted knitting needles crafted from birch wood. 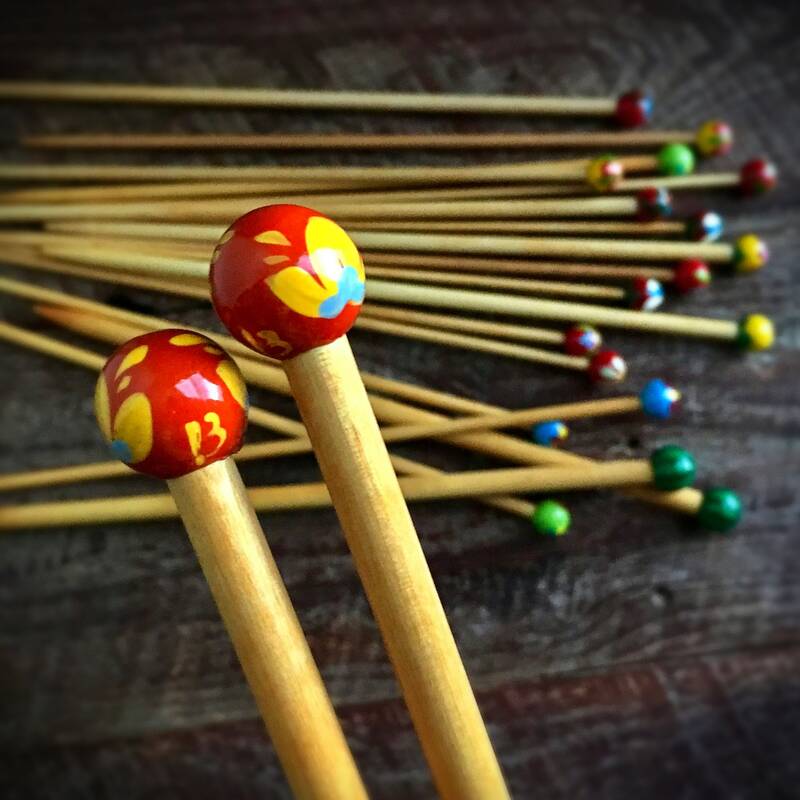 I believe they are WAY better than bamboo! 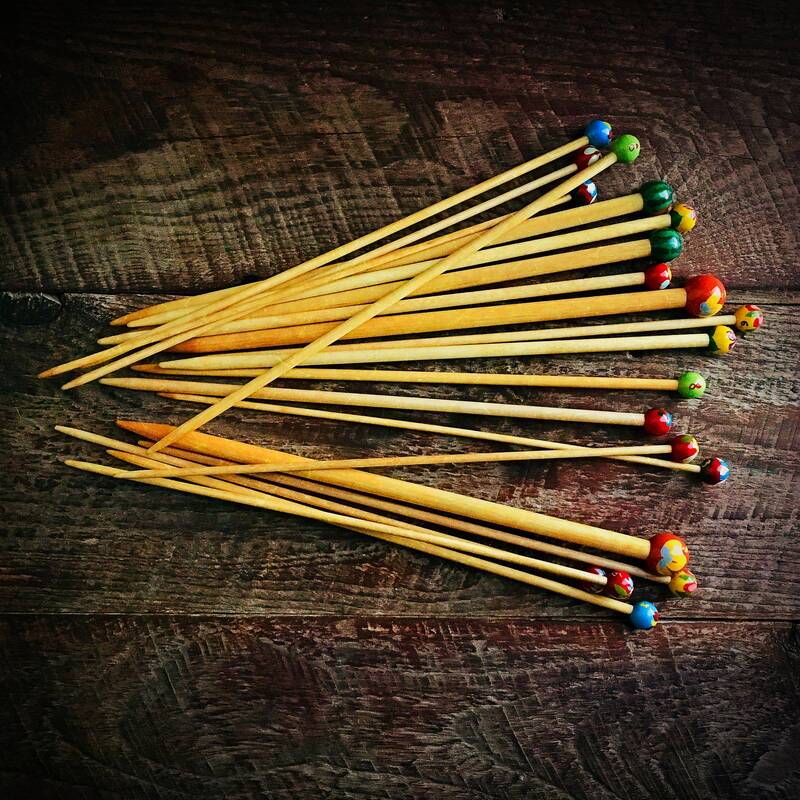 When you purchase the 10 inch (25.5 mm) needles you will receive 9 US sizes #3-#11 (3.25, 3.5, 3.75, 4, 4.5, 5, 5.5, 6.5 mm) excluding #10.5. 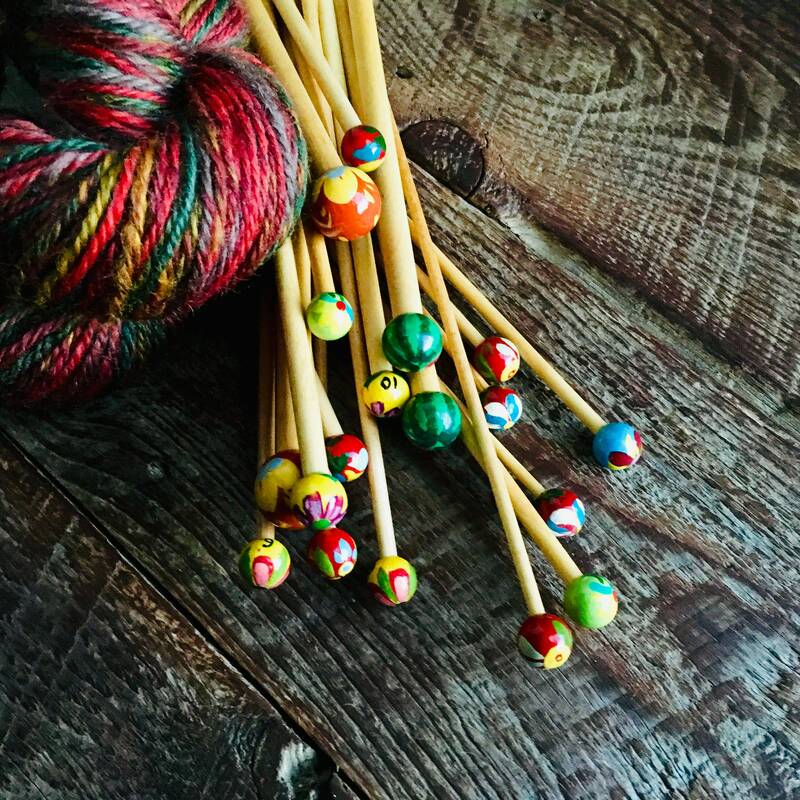 If you choose 14-inch needles (35.5cm), you will receive sizes #4-11. Sizes are marked in US measurements. 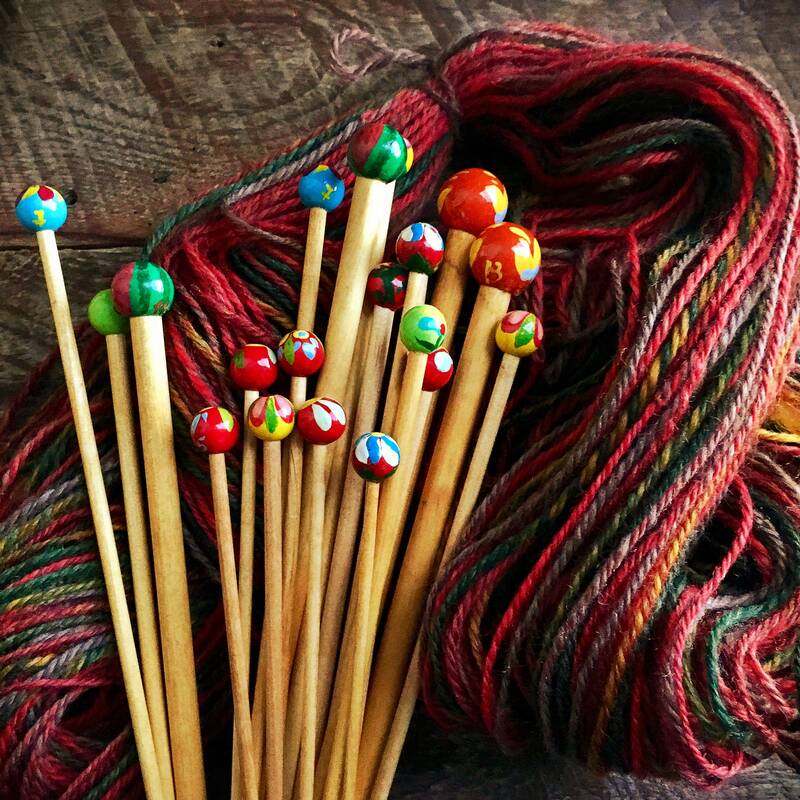 The hand painted knitting needles pictured here may not be the same you receive, but it will be similar. 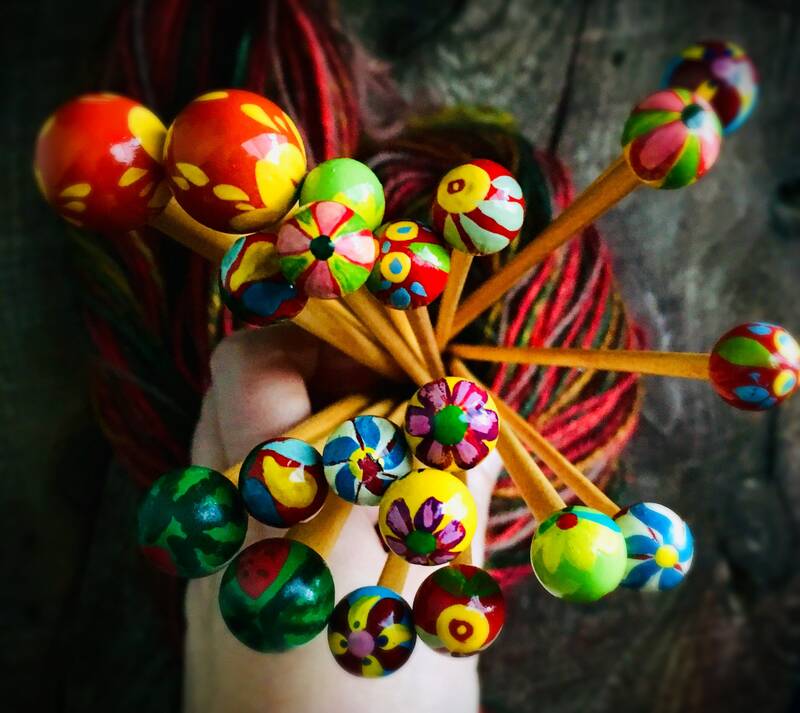 Beautifully hand painted, each knitting needle is unique, and each set is unique as well. They will make you smile every time you pick them up. **Beautifully hand painted by artists in Russia. 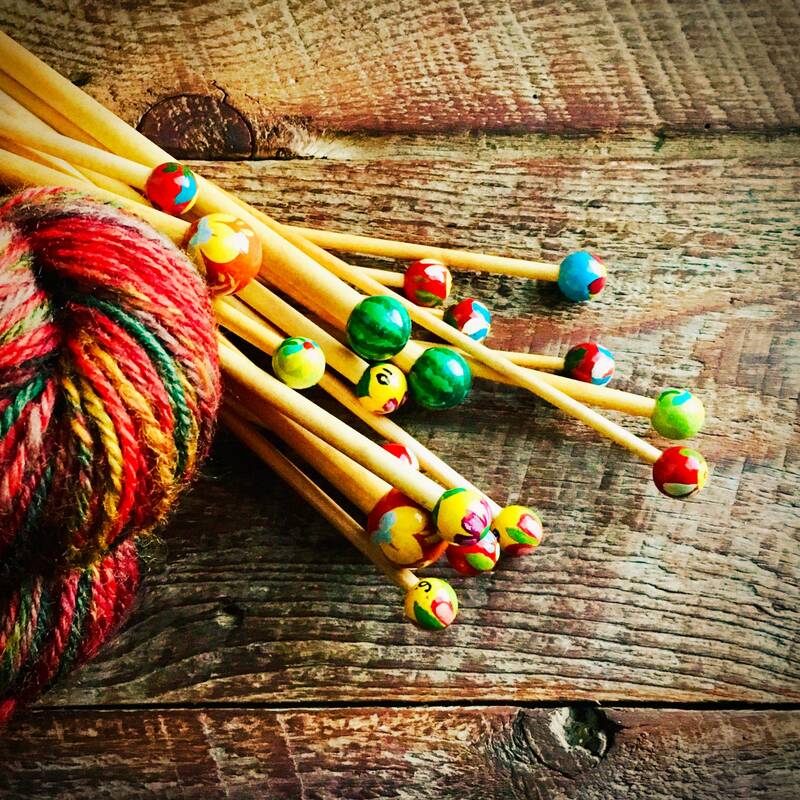 Not only is each knitting needle unique but remember, each set will be unique. 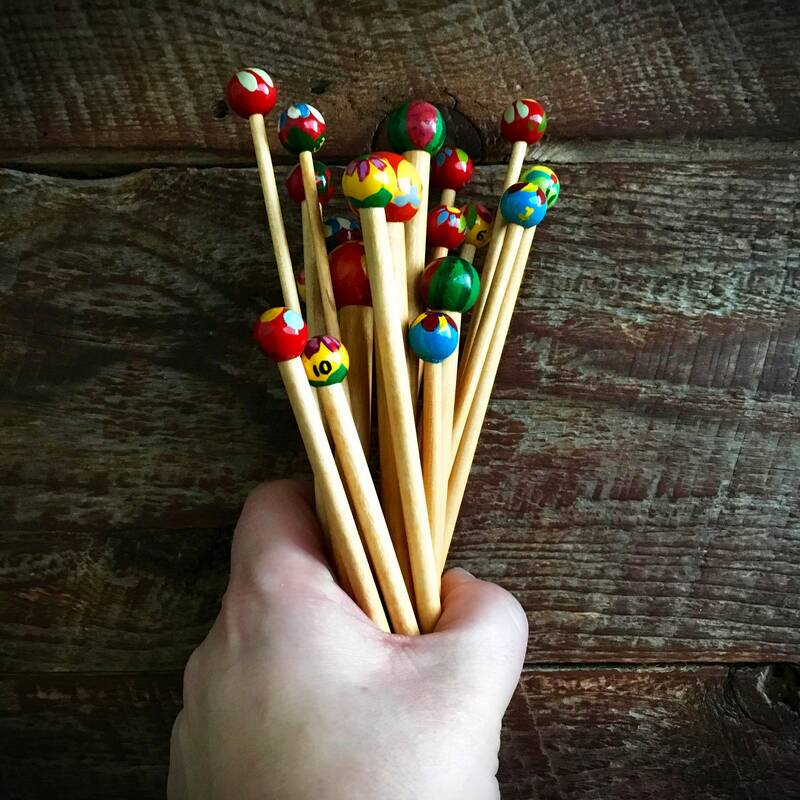 I am sorry, but I cannot allow personal choices of knitting needle tops in these full sets. THANK YOU! These needles are lovely. I will be casting on a new project with them tonight. I can't wait. I am very pleased with this transaction. Shipping was immediate...I will be back to your shop in the near future. Beautiful! Love them - great quality - thank you! 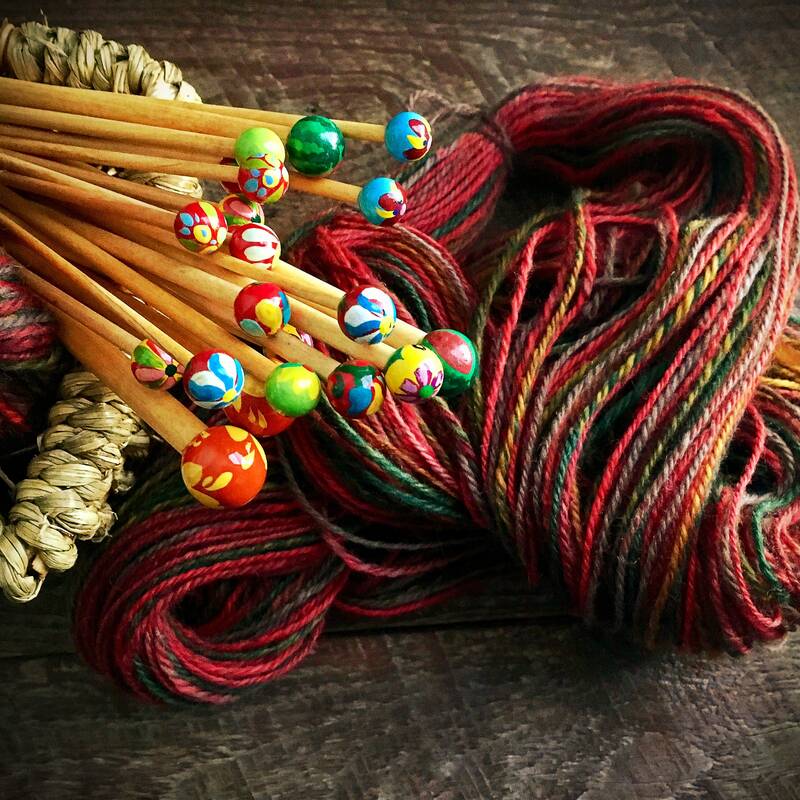 These knitting needles are great. I love them.